Rochester Institute of Technology today announced the launch of a new facility to house MAGIC Spell Studios, a collaborative program that combines entrepreneurship, academics, content creation, production and distribution for digital media such as games, apps, film and art. 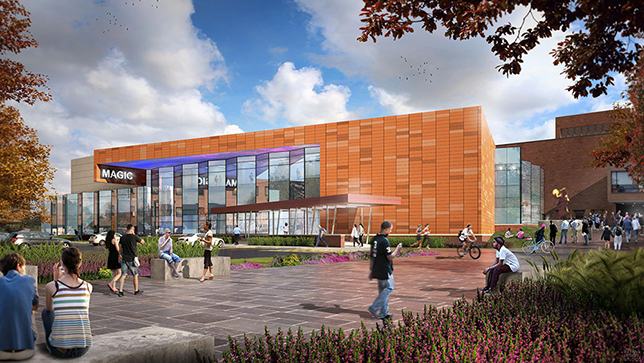 Scheduled to open in fall 2018, the 43,000-square-foot building will feature "a state-of-the-art sound stage, tiered theater with a projection booth and a cinema-quality audiovisual system, sound mixing and color correction rooms, numerous labs and production facilities that will help support RIT's recent designation as a digital gaming hub, and an innovation zone that mixes faculty, staff, students, technology and infrastructure across programs from the School of Film and Animation, the School of Interactive Games and Media, and the RIT Center for Media, Arts, Games, Interaction and Creativity," according to the university. "MAGIC Spell Studios is about being fluid and truly multidisciplinary, and it is revolutionary," said Director Andrew Phelps in a statement. "Through the use of academic programs as a springboard to launch into very different experiences, MAGIC Spell Studios helps students grow their ideas into products and companies and engages students and faculty across disciplines to build these things together from proof-of-concept to refined prototypes that demonstrate commercial viability, and uses the studio at MAGIC to ship them on major channels and storefronts. This is something that the university has never done before." Plans for the facility include dedicated space for internal startups as well as external partners. "This new facility is about exploring new horizons," said Malcolm Spaull, chair of RIT's School of Film and Animation, in a statement. "Consider a new medium like virtual reality. Our faculty are excited by it — it blurs the line between games and film, and everyone is talking about it. But no one is quite sure how this will ultimately inform how we reach audiences and tell stories. That's what the cutting edge looks like, and this effort is about exploring those frontiers together." The university bills MAGIC Spell Studios as the first commercialization studio of its kind in the northeast, expected to help drive the regional economy by "helping … students start up and stand out in the digital media space." As Lt. Gov. Kathy Hochul (D-NY) stated, "MAGIC Spell Studios will be the launching pad for the next generation of digital gaming entrepreneurs, and it is another example of Gov. Cuomo's vision in which academia, business and government are partners in the rebirth of the Upstate economy." The project is supported by $13.5 million in funding from the State of New York, $3 million from Dell, $12.4 million from Cisco Systems and $1.5 million from The Wegman Family Charitable Foundation. For more information about the facility, including a video tour, visit the RIT site.